Painting crosswalks, a seemingly innocuous task, can actually be illegal in some areas, so before starting ensure that you have the legal right and any necessary permits to paint the walkway before starting. Another thing to keep in mind is the danger of being harmed by street traffic, so whenever possible, have the street closed while you paint. After taking these aspects into consideration, the actual act of painting a crosswalk is quite simple and straightforward and can be done by just about anyone. Locate an appropriate site for the crosswalk. A safe location would be near a stop sign or traffic light, or where a crossing guard will stop traffic to help pedestrians cross, such as in front of a school. Use a measuring tape or some type of similarly flexible object to make a straight line from one street corner to the next. Paint along the edge of the measuring tape just enough to guide you, then remove the tape. Take a paint roller and paint along the line you have just painted, using white paint. Make a second coat as necessary. This line should now be about 8 or 9 inches thick. 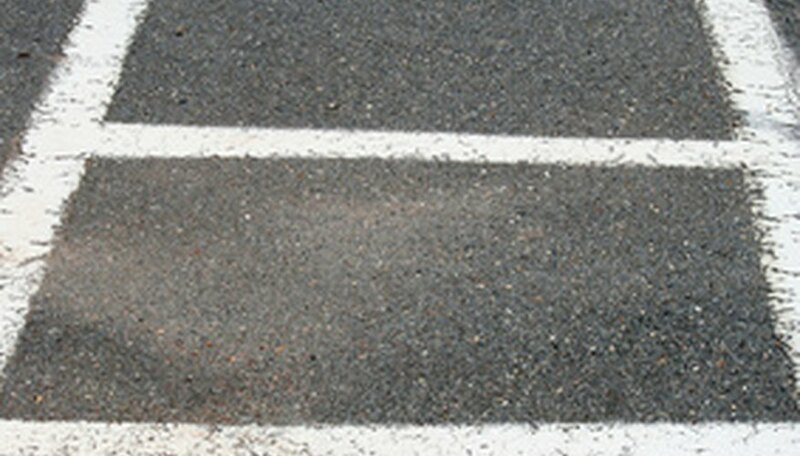 Measure a parallel line joining the two street corners about 2 feet from your first line. Use the paint roller to paint the second line. Attach the two parallel lines by using the paint roller to paint from one line to the other. Take your measuring tape and mark evenly spaced lines along one of your two parallel lines. For example, if your paint roller is 6 inches, make a mark every 6 inches; if your paint roller is 8 inches, make marks every 8 inches. Leave an unpainted space the width of the paint roller and then connect the two parallel lines again using the paint roller. Alternate unpainted spaces with painted stripes until you have run out of space between the street corners. You can use spray paint instead of using roll-on paint, but it can be costly and take a bit more control than using a paint roller.